DROKKR showcases his diverse bass and electronics in this week’s session. In our first hour we’ve music from Regis, DJ Bone, Radioactive Man, Dom & Roland, Detboi, DJ Funk, Drax, and Stevie Nicks. Our guest this week is DROKKR, and Dave Mono, and SLOMOKLOKS. Dave Barrett is all of these entities. Hailing from Cork, Ireland Barrett has been producing beats of note for a while now and we’ve great pleasure in presenting an exclusive liveset to you all. DROKKR is his harder, 140 thing. But it has moved away from a sound that saw him supporting the likes of Hellfish and N-Vitral, Bangface Weekender and dark club spaces in techno mecca Berlin. The Dave Mono project channels his long time love of all things electro and techno, and he’s currently working on a follow up to his debut Mono longplayer Stargazing as I speak. His most recent alias is SLOMOKLOKS – a project with one one caveat, one rule – everything is to be produced at 100bpm. That’s it. This alias can and has drawn influence from ambient to dubstep to IDM, to sounds that frankly deft easy genre pigeon holing. 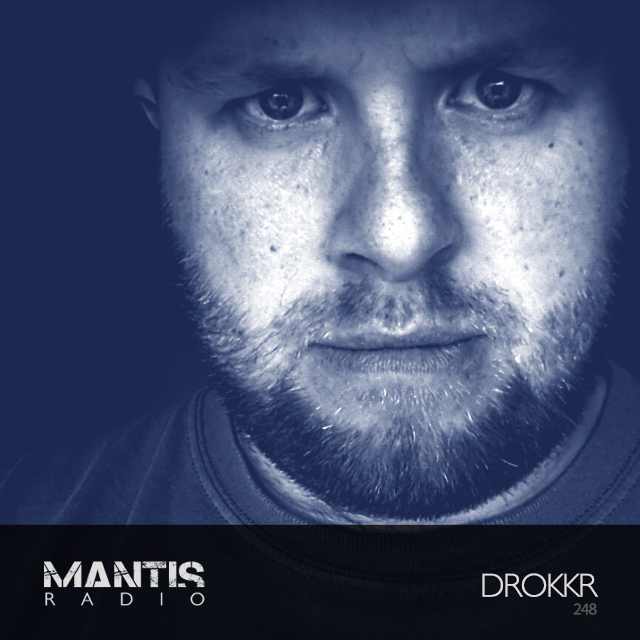 Taking you and I to the end of the show, for Mantis Radio 248 it’s DROKKR.